I went out into the world to read tonight. I have a very complex to read pile right now. Christianity side by side with the Weird side by side with core science fiction and fantasy side by side with non-genre and non-fiction. Tonight I was reading about Scrum. I read as I ate dinner and then I read at Sweet Lucie’s Scoop Shop. There are 2 reasons I decided to write this post (other than taking a break reading about Scrum). 1) Brownie Peanut Butter Ice Cream: I usually enjoy Earl Grey Ice Cream or Lavender Something or other. There’s something awesome about feeling like a kid, because ice cream, while enjoying a flavor I wouldn’t have touched growing up. Sometimes I’m in the mood for Pistachio or Mint Chocolate Chip. This was the first time I’d encountered Brownie Peanut Butter Ice Cream at Sweet Lucie’s. I chatted with the owner and he shared that they make flavors incorporating brownies on brownie delivery days. Brownies are one of the options for cookie sandwiches and when they cut the circles out of the sheet of brownies there are scraps left over. Of course these get incorporated into Brownie Peanut Butter Ice Cream. 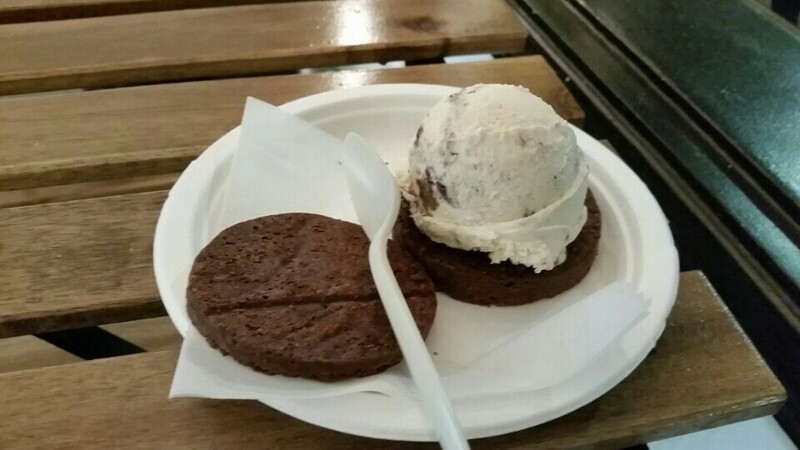 Pictured above is a brownie ice cream sandwich with Brownie Peanut Butter Ice Cream. Inception was mentioned when I ordered that. 2) Avoidance of Cross Contamination: I lived for many years with someone who suffered from Celiac and thus learned the importance of 100% avoiding the introduction of an allergen. Sweet Lucie’s is great on this front for a number of reasons, but one of my favorite is the segregation of the scoops for their vegan options. I usually sit right by the door, because I enjoy hearing the reactions when people see more than just sherbet as a vegan option. I tasted the vegan coffee ice cream tonight and I can highly recommend. They make it using a coconut milk base. I wouldn’t necessarily recommend a chapter of Scrum with your ice cream, but I’d recommend a scoop of Sweet Lucie’s with almost anything. I posted this on Facebook last year, but the message of acknowledging and supporting sub-groups is an important one. I’m discussing this at church with respect to how we interact with fellow Christians from other denominations. The science fiction and gaming communities are in a constant struggle with respect to who is considered a fan. On the eve of the LA Marathon it is important to remember that runners come in all shapes and sizes (and speeds). When looking at humanity in general, erasure of sub-groups is a good way of describing much of the injustice in the world. Sharing [the wikipedia article on Bisexual Erasure] on the Anniversary of marrying an LGBT woman. I am a cisgendered heterosexual male. My situation would on the surface seem to be one more argument on the side of “bi-sexuals don’t exist.” The woman I married on Feb. 13th thought she was bi-sexual. It took quite a lot of struggle to figure out that she was actually a Lesbian. My heart was shattered that the love of my life wouldn’t be sharing that love for the rest of my life, but if she can struggle through all of that and find happiness anyone can – even me. When the majority denies that a minority category exists (or isn’t important or shouldn’t exist or is wrong for one reason or another) it shuts down discussion. It makes it almost impossible for someone who is part of that minority (or thinks they might be) to figure out who they are. Figuring out who you are is hard. This makes WAY harder than it should be. For me, bisexual erasure means that someone I care about suffered much longer than she should have. It means that part of what made my marriage unique and beautiful was invisible. Half of my better half was invisible. This seems like a perfect place to point out the 2 volumes edited by Jim C. Hines: Invisible: Personal Essays on Representation in SF/F and Invisible 2: Personal Essays on Representation in SF/F. Tor.com started publishing novellas last year and Binti by Nnedi Okorafor is the second I’ve read. It’s an amazing story about a smart young woman caught between 2 warring parties, one human and one alien. Separated from her family and then her new friends, both her talents and her outsider status amongst space-faring humanity place her in a position to broker peace. This is great science fiction with aliens and organic spaceships and ancient technology and more. There’s a line that gets at the heart of what makes this novella particularly awesome. Thankfully, they knew not to touch my hair again. I don’t like war either. Binti, the main character, is different. She’s African – specifically Himba, with elaborate braids in her hair and covered head to toe in a paste made from a combination of oils and red clay. I love that the cover by Dave Palumbo captures these elements as they are more than just ways to describe the character and make her unique. Her hair, the red paste covering her, and the meditative trance she uses to absorb the oral tradition her father recites to her all become integral to the deeply science fictional plot. I absolutely loved this story. The issues of culture and identity. The issues of Academia. A war based on a lack of communication. I also just finished reading Future Visions and many of the stories involved machine translation. I highly recommend you read Binti. It definitely moved Lagoon to the top of my reading pile. I reviewed the stage production of 1984 after watching it opening night in January. The last 2 shows at the Broad Stage in Santa Monica are on Saturday the 6th. I’d highly recommend you try and attend if it isn’t sold out. It looks like the next place to catch this production will be at the American Repertory Theater at Harvard February 14th through March 6th. On a remote, icy planet, the soldier known as Breq is drawing closer to completing her quest. Once, she was the Justice of Toren – a colossal starship with an artificial intelligence linking thousands of soldiers in the service of the Radch, the empire that conquered the galaxy. Now, an act of treachery has ripped it all away, leaving her with one fragile human body, unanswered questions, and a burning desire for vengeance. There are some rather intense speculative set pieces underlying Ann Leckie’s Ancillary Justice, the first novel in a trilogy. The grand idea of “an artificial intelligence linking thousands of soldiers” is first explored in unique narrative sections where multiple viewpoints are offered by a single viewpoint character. It’s handled well. However, it’s later revealed that these Ancillaries of the ship are prisoners of war who have had their consciousness completely override by the ships artificial intelligence. The practicality and horror (interesting reading this right after zer0es) of this practice colors the narrative but isn’t explored too deeply. The lack of gender in the language of the Radch has been a major discussion point for this book. I particularly like this piece about translating this series into other languages. The exclusive use of female pronouns by the narrator requires the reader to think a bit more deeply about default character assumptions. However, I’ve heard less discussion of the concept of clientage. As I read it, it’s basically a contract like marriage, except with an explicit one way power dynamic and no concept of monogamy. Filtered through the lack of gender distinctions, the concept of clientage offered me plenty to think about with respect to our current views of relationships, contracts and privilege. There’s a running dialog with religion throughout the novel. The integration of local deities into the pantheon worshiped by the Radch, the devout worship of Radch soldiers, and Breq’s personal icons all contribute to a rich view of religion in the universe Leckie created. The exclusion of Ancillaries from worship and Breq’s view of religion as superstition and simply part of her disguise are in conflict with the comfort she finds at important moments in the Radch reliance on fate and chance. The opening passage of the book offers a shorthand translation between our religious concept of grace and service and the Radch religious concepts of serendipity and chance. From the good Samaritan opening to that action’s fate like importance to the resolution of the climax, this novel explores deep issues in the trappings of a traditional space opera. The multiple literal interpretations of a mind struggling against itself resonates with my personal struggles with depression. The protective buffer of empire and fear of other resonates with my white male American privilege. Neither of these are ideas I enjoy confronting, but experiencing them in the medium of science fiction (particularly science fiction done this well) is a starting point for some great self reflection. Five hackers are forced to work for the government and get drawn into a dangerous conspiracy involving a malicious artificial intelligence. Mr. Robot and Person of Interest have shown that this premise can be done well – shine even. I picked up Zer0es after reminding myself how much I like Chuck Wendig’s writing with Aftermath. I’ve also read and enjoyed Double Dead and Blackbirds. Chuck Wendig writes strong, difficult to like characters that tend to grow on you (or die or both). He writes a no nonsense in your face fast paced narrative. The five hackers are diverse both in talent and background. Old and young, men and women, multiple races, multiple body types. The author definitely starts from stereotypes for both the types of hackers and the characters. The characters get fleshed out fairly well. There’s a definite Breakfast Club vibe as the characters bounce off of each other. The pacing as the team is assembled by an FBI suit is thriller appropriate and never really slogs. There’s a parallel team being assembled by a significantly more sinister character that maintains an ominous tension. The problems crop up in the technology side of the techno-thriller. Sitting in front of a computer is difficult to make both realistic and exciting and it’s easy to lose both in the process. Wendig uses plenty of good terminology, but then inevitably falls back to bad TV-tropes. Technology is introduced that would be more at home in a far future sci-fi than in the ambiguous present day, and this is done for no apparent reason. The conspiracy driving the plot is flatly evil in a “humanity good; technology bad” sort of way. I had to remind myself I wasn’t reading Michael Crichton. The final resolution of the climax seems like it could have been accomplished remotely without putting anyone into harms way, because … hackers. Ultimately Zer0es fails as the near future sci-fi it was trying to be, but the world this novel sets up involves the start of a technology driven zombie apocalypse, which I think is squarely in Wendig’s wheelhouse. While I don’t enthusiastically recommend this book, I enjoyed it in spite of its flaws and look forward to future volumes.